Today is a grim anniversary. It was on April 9, 1940, that Operation Weserübung (the Weser Exercise) was implemented by the German army against Norway and Denmark. There was resistance, some of it heroic, but it was no contest in the long run. For the rest of the war, Norway and Denmark would be occupied territory. If you see the movie The King’s Choice, which I reviewed a few days back, you’ll get the gist of the story of how the government and the royal family fled Oslo and eventually went into exile. One element of the movie that hasn’t aroused much notice is the general fecklessness of the parliamentary leaders in response to the attack. There’s no surprise there; we don’t often look to politicians for valor and sacrifice. But there’s another element, not suggested in the film. The parliamentary leaders weren’t entirely sure Hitler was the enemy. 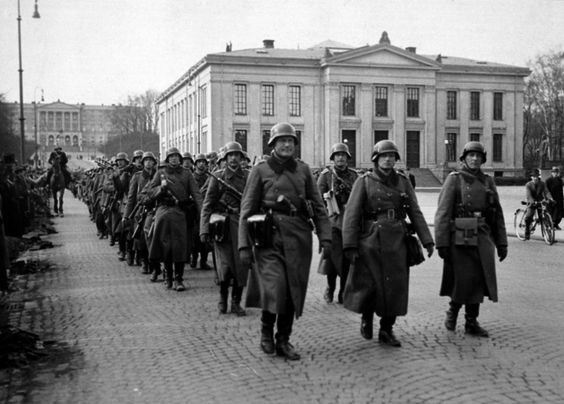 The Norwegian government in the spring of 1940 was led by the Labor (Arbeider) Party. The Labor Party was by and large a wholly owned subsidiary of Josef Stalin’s Kremlin, which had been bankrolling it for years. Labor leaders in those days didn’t go to the loo without checking with their Russian handlers first. During spring of 1940, the Molotov-Ribbentrop Pact was in force, making Hitler and Stalin allies. So when the Germans marched in, the Labor leaders were inclined to greet them as friends. The only thing that prevented them from enthusiastically joining in the “Heil!” salutes was the Germans’ incredibly ham-handed conduct. It wouldn’t be until June 1941 that Hitler would break the pact by launching Operation Barbarossa against Russian possessions. At that point Labor became solidly anti-Nazi, going carefully into denial about their earlier collaborationist sentiments. And so it remains, even unto this day.